2002–2006: Interdisciplinary Support to Development of Mediterranean Agriculture in Croatia, 0091001, MST RC; Position: Ph.D. student. 2004-2007: Increase of Olive Tree Productivity by Selecting the Suitable Pollinator Increase of Olive Tree Productivity by Selecting the Suitable Pollinator, ARC Project, MAFWM RC (V-16-7/04). Position: Collaborating investigator. 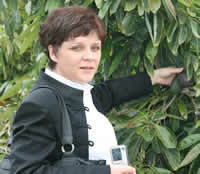 2004–2007: Establishment of the Citrus Foundation Mother Block on the Adriatic Area of Croatia (TP_03/0091_08), MSES RC. Position: Collaborating investigator. 2006–2009: Maraska dalmatina; MAFWM RC; Position: Collaborating investigator. 2007-2010: Evaluation, Preservation and Utilization of Olive Genetic Resources (091-0910468-0166). Position: Ph.D. student. 2009-: Croatia agriculture research and education exchange; USDA. Position: Collaborating investigator.